The enzymes in raw pineapple drastically aid in cellular recovery (imperative after any kind of exercise or deep tissue body work), and supports digestion; which explains why it is one of the few juices, allopathic (Traditional Western) doctors recommend for consumption as a cellular recovery juice after any kind of surgery or other procedure. Bromelain, the enzyme found in pineapple, effectively breaks down matter in the intestines, improving assimilation of nutrients and helping to achieve a clarity in the gut that will support glowing health. 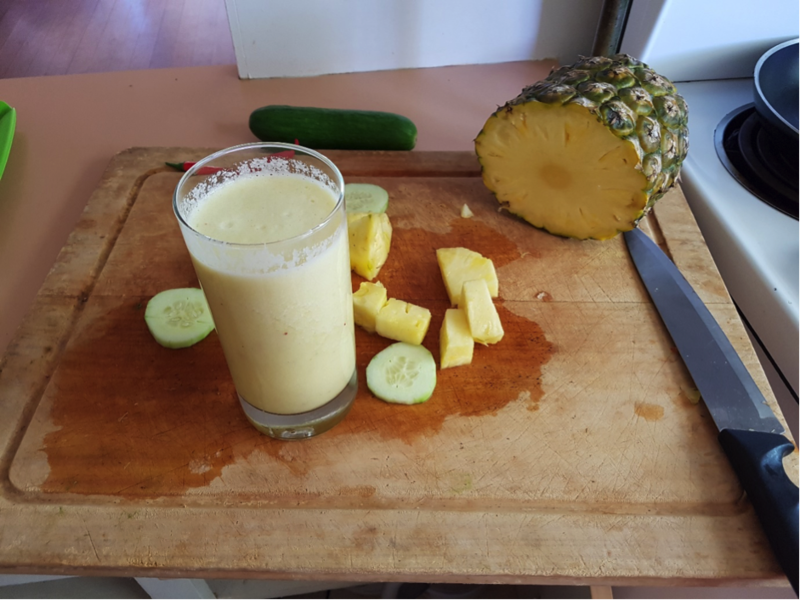 In this recipe, there is enough pineapple for the effects of the bromelain to be powerful; because it is high in natural sugars we balance the pineapple with the cucumber, which alkalizes and lubricates the digestive tract in order to minimise the absorption of sugar to prevent any blood sugar spikes. Jalapeño (or any pepper you like really) gives a metabolism-boosting and blood-warming hit. ★ Feed all the ingredients into a juicer, alternating ingredients for easier juicing. ★ Stir and serve, simple!